Eurasian Bee-eater ( Merops apiaster) :These spectacularly colored small birds are true to their name and do eat bees, as well as wasps, hornets and other insects which they catch mid-air when they fly off from an open perch preferably in a dead tree. Bee-eaters are migratory , breeding in warm climates where they next colonially and build tunnel nests in sandy river banks .Seen here, with the 12-12-12 tri-date and cancelled in Bucharest, on a pre-paid cover plus a matching stamp for correct international postage. 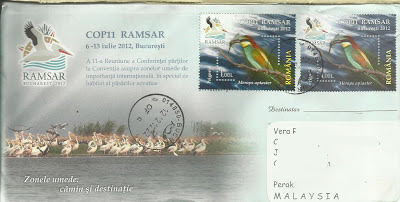 Cover commemorates the Bucharest Ramsar convention July 2012.